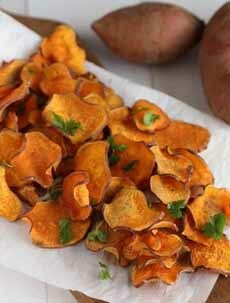 We’re making lots of these sweet potato chips (photo #1) for Super Bowl Sunday. It’s very easy. The chips have a slight flavor kick over traditional sweet potato chips: flavored olive oil. 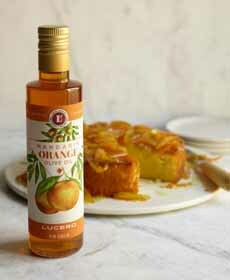 The Lucero olive oil company made them with their Mandarin Orange Olive Oil (photo #2). We have numerous flavored oils, so we’re making three different batches—with orange, chili and rosemary oils. You can use flavored oils with white-potato chips as well. Basil oil is an especially yummy choice. 1. PREHEAT the oven to 325°F with the rack in the middle. Scrub the sweet potatoes and slice them into very thin pieces using a mandoline. 2. COMBINE the olive oil and the orange zest. Brush 2 baking sheets with the some of the oil mixture and arrange one layer of sweet potatoes. Brush the tops of the sweet potatoes with oil mixture, and sprinkle with thyme, salt and pepper to taste. 3. PLACE the rack in the oven and bake about 20 minute, until they are golden brown and the centers are dry to the touch. Place the baking sheet on a wire rack and allow to cool for 3 minutes. Then carefully transfer the chips to a serving dish. 4. REPEAT the process until you use up the sweet potato. *Think level measuring cups. This is not a lot of chips! Thin, crisp sweet potato chips with a hint of orange flavor. (both photos courtesy Lucero Olive Oil.